is there an qwertz Version??? Argh, things like this make me think about jailbreaking my iPhone again ! Since this mod changes the position of the letters slightly, I removed it. It still left something behind, because when I tap on the globe to switch to my clipboard, it says 5-Row QWERTY on the space bar, but nothing changes. After uninstall, respring and reboot didn’t help, so I’m stuck with this annoyance for now. 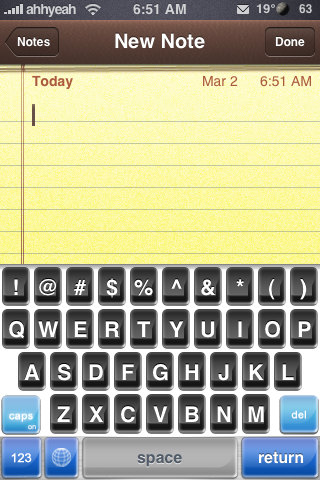 You may not have 5 Row QWERTY turned off in General > Keyboard > International Keyboards. I like this. I’ve had it for awhile now and it’s a real keyboard. The arrow keys are a bonus, but numbers on the keyboard are really handy, once you adjust, and I adjusted fast. this is nice and quite useful actually. 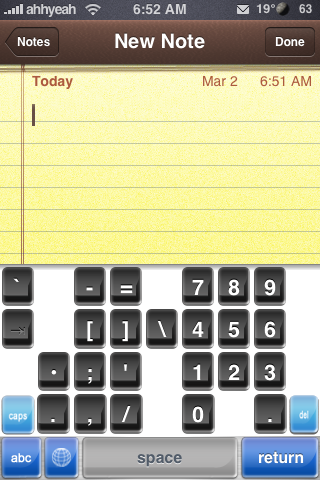 i always hated jumping between different layouts just to type numbers or use a symbol or punctuation. now its more accessible and easier to use. the only thing which i dont like is its getting a little used to typing now with the keys places so closely. What theme are you using for the keyboard? I just install this app on my 3G iphone, but it doesn’t work all all. i already activate @ general setting 5-row toggle on.